SMARTci provides best practice for buildings with a continuous insulation system. 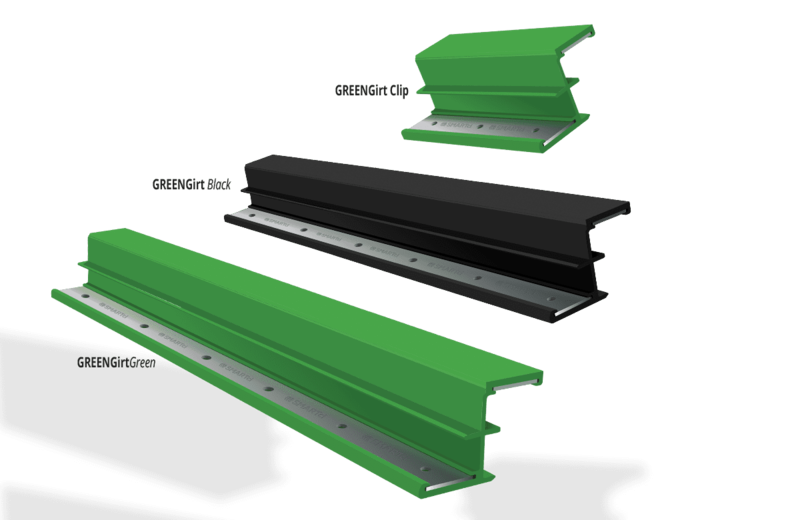 Patented GREENGirt provides a thermal break and mounting platform for cladding applications. It is a flexible design that works universally with any substrate, insulation or cladding. When metal is used to connect the exterior components of a building directly to the interior framing, this causes a thermal bridge. This thermal path of least resistance allows heat (or cold) to escape, creating a vulnerability for cold spots and allowing moisture problems. Using materials that eliminate the thermal bridge help avoid unnecessary heating and cooling costs. Continuous Insulation by SMARTci is the Solution! SMARTci was designed to address the inadequacies of other continuous insulation solutions. Its individual parts were created as a simple, complete solution to help you design smarter buildings. Plus, it’s the best assembly to help you earn points toward LEED certification. Unlike other attachment systems, SMARTci has zero thermal short fasteners. It doesn’t create cold spots for condensation inside your walls. It has a universal attachment design for virtually any cladding, and it can be used over multiple surfaces — not just stud walls. SMARTci was created with one goal in mind: to make buildings more efficient. Specially designed to block off heat gaps that other solutions leave, SMARTci’s thermal efficiency makes it a long-term investment in your building. SMARTci was created with one goal in mind: To make buildings more efficient. SMARTci was specially designed to eliminate thermal gaps that other systems neglect. 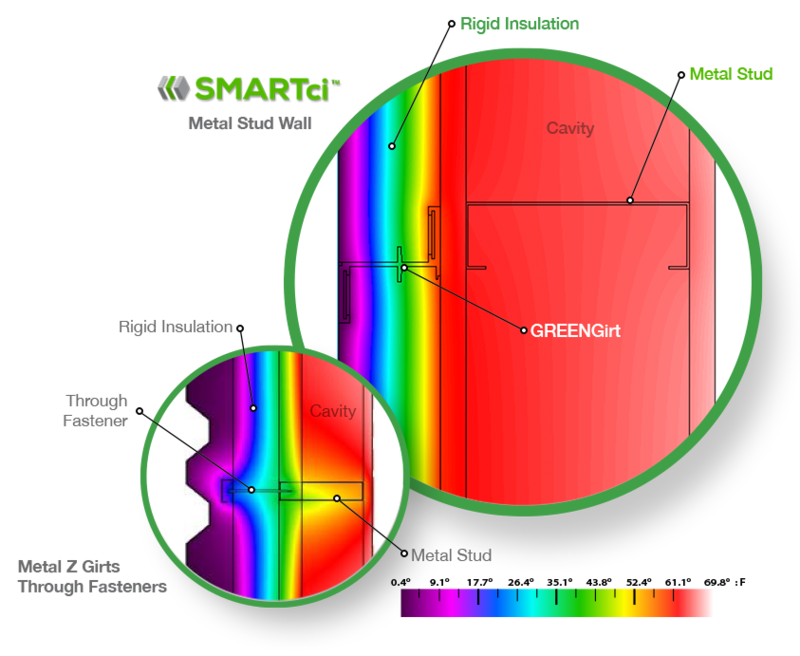 The SMARTci system consists of the innovative insulated composite GREENGirt and an engineered insulation system. GREENGirt joins the building cladding and insulation to a building structure. It is superior to steel structurally and thermally. GREENGirt provides the same loading capabilities of a Z girt of equivalent depth. Metal girts and through-fasteners create thermal bridging, GREENGirt eliminates these. GREENGirt is not susceptible to moisture, corrosion or electrochemical reactions. 1.5”, 2“, 2.5“, 3“, 3.5“, 4“, 4.5“, 5“, 5.5“, 6“ and 8“ depths. GREENGirt is available in our standard color Green or custom Black for a surcharge. It can be installed horizontally, vertically or diagonally. Standard girt length is 96 inches. SMARTci has been designed via finite element analysis (FEA), fully tested with ASTM, NFPA 285 and UL agencies and proven in the field. All components and materials in the SMARTci system have been vigorously tested and proven in the construction industry.